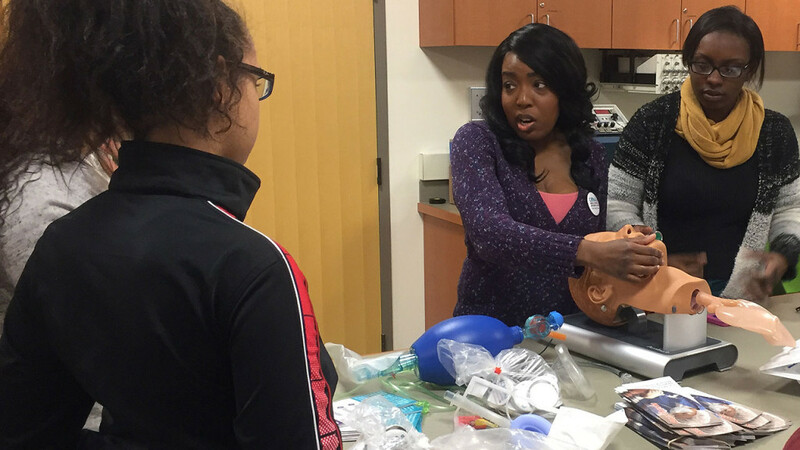 Natalie Hutchinson, a student in the doctor of nursing practice program at Quinnipiac University, demonstrates on a mannequin, while explaining what nurse anesthetists do during a Jan. 26 visit to the School of Nursing by students from Hill Regional Career High School of New Haven. Natalie Hutchinson, a student in the doctor of nursing practice program at Quinnipiac University, demonstrates on a mannequin, while explaining what nurse anesthetists do during a Jan. 26 visit to the School of Nursing by students from Hill Regional Career High School of New Haven. Hill Regional Career High students, Tanijaha Harrington, far right, and Kayla Daniels, who is facing away from the camera, were among the Health Career Pathways students who participated in a series of inter-professional events hosted by the schools of medicine, nursing and health sciences at Quinnipiac. The students’ visit came during National Nurse Anesthetists Week, Jan. 24-30. The weeklong observance is part of the American Association of Nurse Anesthetists’ annual celebration of the nation’s more than 49,000 certified registered nurse anesthetists and student registered nurse anesthetists who safely and cost-effectively provide approximately 40 million anesthetics each year. Recognizing nurse anesthetists helps patients, hospital administrators, health care professionals, policymakers and others become more familiar with the CRNA credential, their education and the advanced practice registered nurses who have earned it.